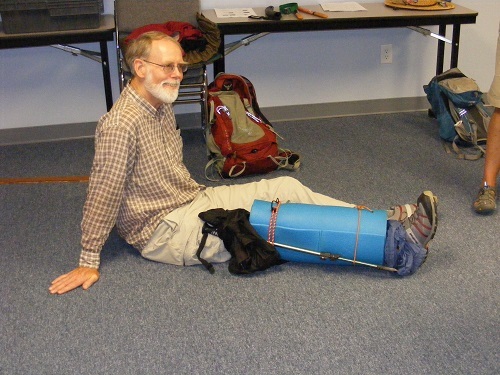 Six Headwaters Master Naturalists and one interested individual met over the weekend of June 28th and 29th to learn from Brad and Paula Neher of Emergency Prep in Harrisonburg about handling common injuries and illnesses in the field when medical care is an hour or more away. But first things first: let’s define what’s meant by Wilderness First Aid. Wilderness First Aid (WFA) is the assessment of and treatment given to an ill or injured person in a remote environment where definitive care by a physician and/or rapid transport team is not readily available. In addition to assessment and treatment, possible emergency containment techniques might be taught. 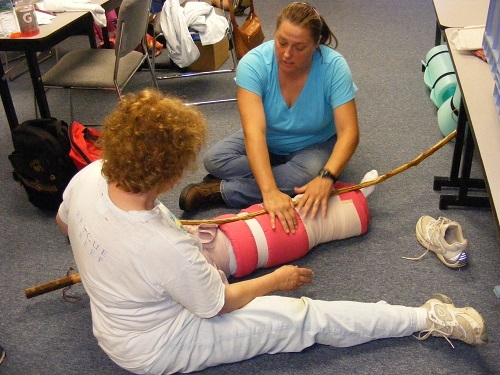 Going beyond what you may know as “first aid”, you discover the deeper purpose of WFA is to train participants to prevent acute situations and only when necessary, manage them. While it contains substantial medical information and teaches skills required for medical emergencies in the wild, the bottom line is this: it’s more effective to prevent an incident than to manage it. But accidents do happen and better decision-making at the incident scene miles from medical facilities or help can save valuable time and human resources. It can save lives too. 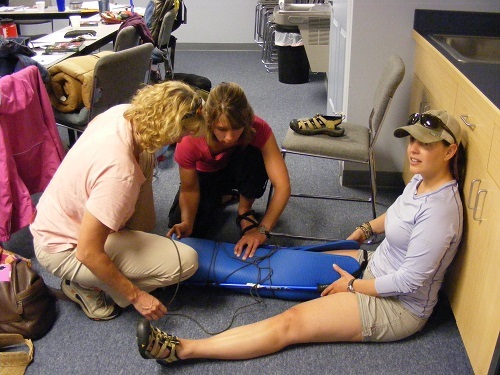 Generally speaking, any WFA course is a 2-day training that provides introductory medical skills to those of us who may be involved with group activities in remote environments. Through a hands-on and scenario-based approach, WFA offers the skills and confidence needed to make informed medical decisions when accidents happen in these remote locations. The WFA course includes short lectures along with increasingly challenging practice scenarios that help us master the central concepts of remote medicine and learn effective responses to an emergency. Here’s the typical practice scenario outline: Accidents happen. People get hurt, sick, or lost. The temperature drops, the wind picks up, and it starts to rain. What can you do to offer positive and worthwhile help? 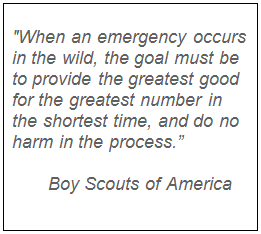 Although many backcountry emergencies are preventable, when bad things do happen sometimes the wrong care can make things worse. By learning a few basic skills, you can make the difference between a good outcome and a bad one. Making that difference is what we worked on the weekend of June 28/29. It surprised me how clear it became, when faced with a simple beginning scenario, how unprepared I was. We learned how to assess the situation for safety, how to safeguard ourselves and then how to address primary and secondary patient assessment using simple mnemonics and acronyms. Using “at hand” materials we practiced splinting, bandaging and dealing with shock, hypothermia, heat exhaustion and heat stroke among other conditions such as insect bites, snakebites, allergies and anaphylaxis. It was a lot of information to assimilate but it was thoroughly engaging and we felt fully supported by the teaching team of Brad and Paula. They watched us closely and listening to our questions responded with thoughtful care and whatever detail we needed. The practice scenarios were both inside and outside and we got pretty darn creative with them. My comfort level increased and I moved from “frozen” to decisive. Courtney attended to by Jo-el and Heather Lantz. This WFA course was a re-certification for Malcolm Cameron and he felt the training here in Harrisonburg was comparable to the SOLO training he received almost two years ago in Charlottesville. He even learned some new things. Courtney Hallacher liked the small size of the class and felt the learning achieved was well worth the time spent: although a model of shorter classes over a longer time frame would have been her preference to aid in memory retention. Margaret Speicher greatly appreciated the hands-on practice scenarios and was pleased the course did not go for distracting and overly graphic injury drama. Jo-el Nelson also felt the course met her expectations and echoed the same willingness expressed across the board to consider this course for WFA re-certification. Sue Eckroth was unable to complete the second day of the course but plans to finish with the next group that goes through WFA. Personally, I found the course to be very valuable in exposing my own deficiencies regarding the “how tos” in handling an acute emergency situation and increasing my comfort level with challenging situations. I remain mindful of the need to “practice” these skills regularly. June 30, 2014 in Training.